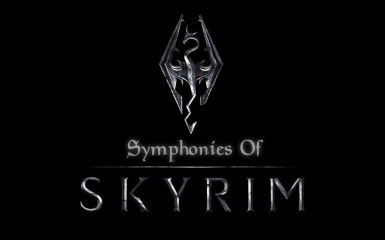 Symphonies of Skyrim offers a plethora of original orchestral music composed specifically for use in Skyrim. All music is additional, and not replacers. All content contained within any downloads are strictly subject to copyright (C) Tom Colebrooke 2015. All files are labelled as such and any re-distribution is prohibited. Original music composed & orchestrated by Thomas A C Colebrooke specifically for use in Skyrim. Added far better compression methods - shrinking the file down to a much more manageable 8MB! 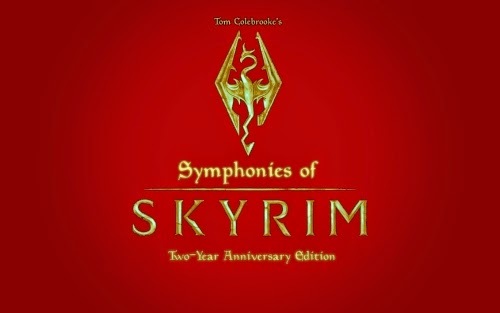 While the Official Skyrim Soundtrack, composed by Jeremy Soule is indeed magnificent, awe-inspiring and perfectly orchestrated for Skyrim, When, like me you have clocked 800+ hours on the game - it is inevitable that you will hear the same melodies over and over, even to the point of becoming tedious. 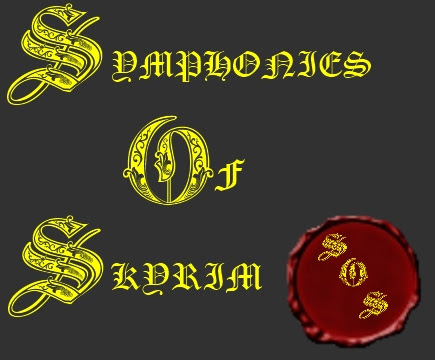 And so, driven by my desire to contribute something to the game that has given me so much, I present: Symphonies of Skyrim. These are all entirely original orchestral compositions that I have composed, orchestrated and mixed. I am a dedicated semi-professional composer and a huge fan of Skyrim. I have thoroughly enjoyed composing music for what I consider to be a true masterpiece of a game. The pieces are of all genres, from epic booming battle ensembles to gentle woodwind exploration motifs. The works are all integrated fully into an .esp, so no additional work is required, simply cut and paste the files in the RAR into the Skyrim/Data folder, and fire up the game! 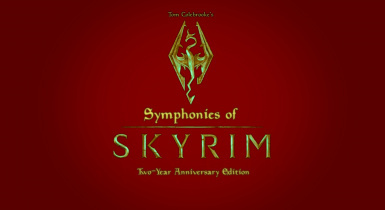 In Version 2.0, there are twenty-five pieces included, adding well over an hour of brand new music to Skyrim's Soundtrack. A lot has changed since I started authoring this mod two years ago. I now have far more weapons in my orchestral arsenal. I am no longer "just a guy with a laptop". I have grown more passionate, competent and driven as a composer - and most of that is down to you guys and your amazing support and comments on my work. It really does make me enormously proud to be part of such a friendly and talented community, so I thank you sincerely for that. So, many thanks for being such a fantastic audience/user-base these past two years. It's been a great ride, and I certainly never expected that the mod would be this well-liked by so many. Thank you once again. And with that, my musical adventures in Skyrim are all but finished. Keep up with my new projects! These compositions are uploaded onto the nexus for download for use in Skyrim ONLY. If you wish to transfer them to any other format or device, please seek permission from me first. I have no issue with copying the files onto other devices for you own private use, but please do not re-distribute publicly or to friends. Please don't forget to leave an endorsement, and any comments, however brief, will be greatly appreciated. All content contained within any downloads are strictly subject to copyright (C) Tom Colebrooke 2016. All files are labelled as such and any re-distribution is prohibited.